Did you catch up with all of Facebook’s recent changes? Don’t worry – you’re not in danger of running out of things to do, because Twitter just started rolling out a major redesign that will apply to Twitter.com, TweetDeck, and all of its mobile apps. Only a small portion of Twitter users are affected so far, but they’ll eventually affect all Twitter users – and they’ll impact brands differently than individuals. Wondering how these changes will affect your organization’s Twitter account? Look no further! Here’s the low-down on the best new features and why they matter. Brand Pages: As with Facebook and Google+, Twitter will now have brand pages for companies, which allow for more functionality and interactions with followers. Initially, these pages will be exclusive to a select group of partners, charities and individuals, but will be rolled out to a wider audience in the coming months. Why it matters: Brands will now be able to customize their pages with larger logos and extended taglines. You’ll also be able to promote one tweet to top of your organization’s timeline, helping to control what message visitors see when they arrive. These tweets will also show any media (like a video) that accompanies the tweet – no clicking required! Nonprofits could easily use this feature to highlight a recent advocacy action or fundraising campaign. Why it matters: Rather than taking a screenshot of a recent tweet, your organization can embed the actual tweet. Fans can respond and retweet on the webpage (a Twitter box will pop up), rather than looking at a static image. A blog post or homepage feature about a recent campaign could include a tweet to a target, and fans could retweet it, or you could pose a question and fans could reply with their answer. Twitter Buttons: In addition to the “tweet” and “follow” buttons, Twitter has introduced the hashtag and mention buttons to place on your website or blog. The codes are here. Why it matters: It’s easier than ever to get your fans involved in a cause. With the click of a button, they can follow your organization, share your campaign hashtag, mention or engage with your organization. 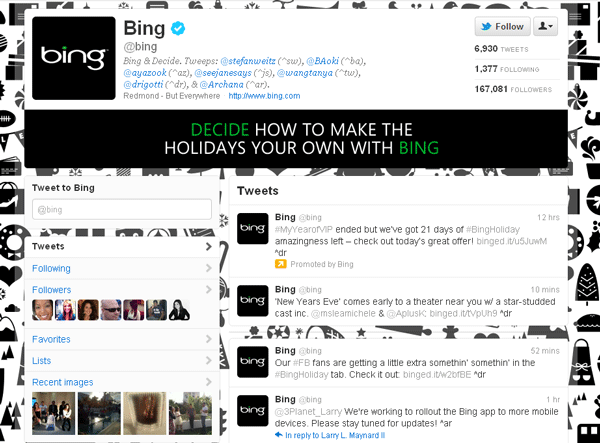 Overall: The changes have affected nearly every aspect of Twitter’s design, including the navigation. The “home” page is the new timeline, which now features media on the timeline itself so that videos and pictures are easier to view. The “connect” page shares mentions and interactions. The “discover” page includes stories relevant to who you follow, and also suggestions new people to follow. Additional profile information is now on the left side of the page. The impact of these changes will be dependent on how new users access Twitter in the future, since they only affect Twitter-related platforms, and it’s unclear how these changes will be reflected in third party platforms. Hope this helps! When your organization’s account gets the new design, let us know what creative ways you find to take advantage of the new redesign. For more on the changes, visit fly.twitter.com.